As the largest and most popular video site in the world, YouTube is like a big passionate community for everyone to find the worldwide trendy & amusing videos, hot music videos & movie trailers, useful how-to tutorials so that there is an increasingly number of people chooses to rip YouTube video to PC or mobile devices. They are eager to rip YouTube video to MP3, convert YouTube to MP4, YouTube to AVI, iPhone, iPad, etc. in order to enjoy those ripped HD videos, funny movies, music videos, TV shows, and tutorials without network connection. 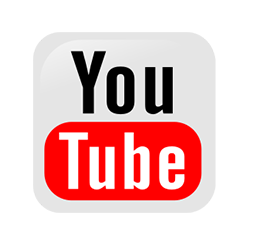 Essentially, we all known that YouTube do not provide any access to download and rip videos from the site, but YouTube fans could find many YouTube video rippers in the market to rip videos with better visions without buffering and ads. 6. Ripping speed too slow. If you encountered these irritating situations, then here we provide a better solution for you – WinX HD Video Converter Deluxe. This spotless and all-in-one YouTube video ripper enables you download & rip any YouTube video and other excellent video from 300+ online video sites like Facebook, Vevo, Twitter, Vimeo, etc. Most importantly, with the fastest ripping speed, this smart YouTube video ripper can help you rip music & movie to iPhone, YouTube to iPad, iPod, MP4, Samsung, etc. without any loss of quality. WinX HD Video Converter Deluxe - Easily rips any YouTube Facebook videos to MP3, MP4, AVI, MKV, MOV, AAC and Apple Android Devices with high video/audio quality and fast speed. Regarded as one of the most versatile YouTube video ripping program, WinX HD Video Converter Deluxe is the first and unique software which support converting HD videos like rip YouTube 1080p video, rip 4K video, rip AVCHD video and MKV, MOD, TOD and Blu-ray video movies or SD videos like rip YouTube video, Yahoo, Facebook, Dailymotion, Vimeo, Break, MTV and so on. With the state-of-the-art video ripping engine, this remarkable YouTube video ripper allows you to download and convert any YouTube video, Yahoo, Facebook, Dailymotion, Vimeo videos from 300+ online video sites. The feature to support multi-core CPU of this YouTube video ripper allows you to take full advantage of up to 8 Cores to maximally increase the processing speed. The improved configuring for i5 i7 CPU, the optimized AMD 3DNow! and Intel SSE3 SSE2 MMX Instructions deliver a 83x faster real time converting speed. The embedded High Quality Engine and "Yadif Double Frames" De-interlacing Engine can optimize image quality dynamically, reduce noise and adjust definition to make the output video more clear. Another great feature in this YouTube video ripper is its video editing function. It has included some of the basic editing tools which provide you the ability to trim clips, adjust settings like change audio volume, crop & expand the video, add extra subtitle. So much for this YouTube ripper's main feature and here is the tutorial on how to rip YouTube video on Windows/Mac easily and quickly. Following up with this specific tutorial, you will find out that the output image and sound quality is amazingly excellent. 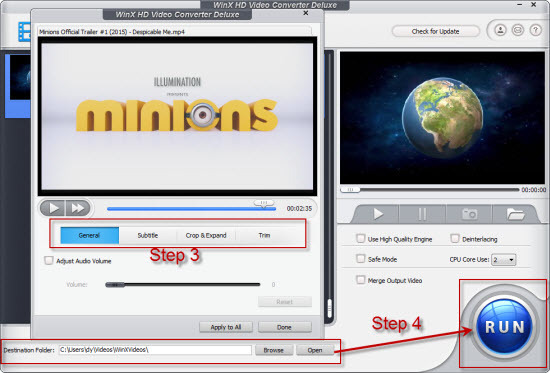 Before converting and ripping YouTube video, please free download WinX HD Video Converter Deluxe. For Mac users, HD Video Converter for Mac is the way to go. Launch this smart YouTube video ripper, there are two buttons located in the upper interface named "Video" and "URL". Then copy YouTube video's URL and paste to this YouTube video ripper, or you can also tap "Video" button to add local video. Next this YouTube ripper starts to analyze the URL or the video. After a while, an output formats window will pop up automatically. Choose an output format > you can convert and rip YouTube video to devices, like YouTube to iPad, YouTube to iPhone or you are also able to convert YouTube video to MP3, AAC, iPhone ringtone and so on. In the parameter setting area, all the parameters are freely adjustable, like Audio/Video Quality, Video frame rate, Output image setting, video resolution and Audio/Video codec. You can customize these data to achieve the best quality you preferred. What's more, one of the unique features of this YouTube video ripper is the adding subtitle function. After setting, tap Run button to start ripping YouTube video. 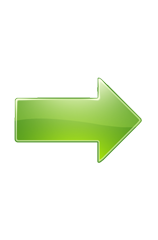 Moreover, you are able to change destination folder. When the converting starts, there are two options list in the conversion window: shut down computer when ripping finished and open output folder when conversion finished. Choose the options you desired.